In third Shabbat meal, Vizhnitzer Rebbe asks followers to strengthen Sabbath observance to positively influence general population. 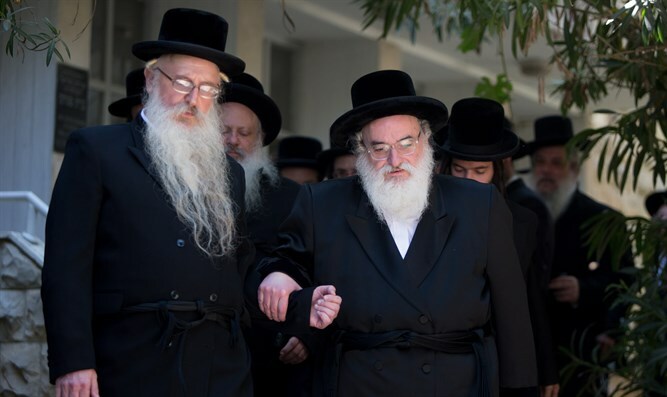 During the Seudah Shlishit third Shabbat meal, the Admur (Rebbe) of Vizhnitz, Rabbi Menachem Mendel Hager spoke about last Thursday's gathering of the Council of Torah Sages and asked his followers to strengthen their Sabbath observance in order to influence the general population. "Great is the pain in face of breaches in observing our holy Shabbos throughout the Holy Land. The living will take it to heart, to increase and intensify the awe of Shabbos among us. We must prepare for the seventh day, to bring in Shabbos early and observe Shabbos with soulful exaltation. And their hearts will awaken to the feeling of the sanctity of the Shabbos and the preservation of its boundaries," said the Admur. He argued that just as on Yom Kippur secular Jews do not desecrate the holiday, so should their awareness about the sanctity of the Sabbath increase. "The reality proves that the holy day of Yom Kippur is observed by all of the public strata; all the roads are desolate and the shops and businesses are shut down and the synagogues are full. This is the reason for the great awe in the face of the Day of Judgment. The fear permeates everyone's hearts and affects them, each according to their comprehension. This is not the case with Shabbos observance, which of course is observed properly, but the elements of fear, emotion, and magnificence are lacking." In the conversation with his followers, the Admur called upon those present to strengthen the sanctity of the Sabbath and thus to project it to the secular public: "We therefore accept upon ourselves to further sanctify the quality of our Shabbos observance, to take advantage of the hours and to create a day of rest and holiness. We will do our work for the sake of our brethren who are caught in the grip of their desires, to awaken their hearts to the magnificent gift that G-d gave to his sons the Nation close to Him," he said.